On display Oct. 2, 2010 through Jan. 2, 2011. 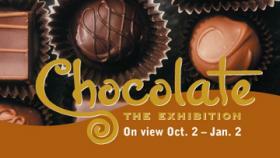 From rainforest treasure to luscious treat — immerse yourself in the story of chocolate. Explore the plant, the products, and the culture of chocolate through the lenses of science, history, and popular culture. The exhibit features experiments and hands-on activities, as well as Mayan, Aztec and 17th-century European artifacts, including items to find, make, and sell this tasty treat. Exhibition text presented in English and Spanish. More Details.